Employees, clients, patients, visitors: You can provide an appealing and safe environment for everyone who visits your commercial, medical, or industrial building at a competitive price with Schill Grounds Management. Schill is your full-service, year-round, commercial landscaping and snow management resource. 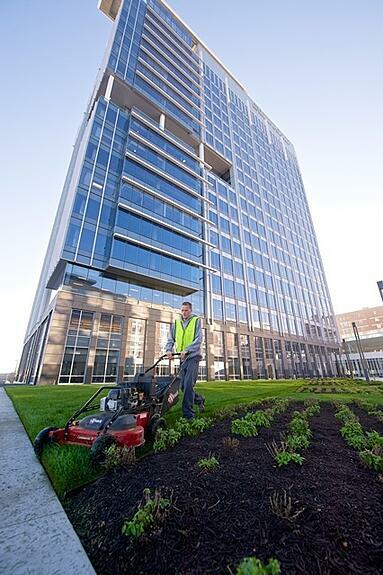 Whether your facility requires landscaping design, spring clean up landscaping or snow plowing and ice removal, we’ll help you create and maintain a first-class appearance that maximizes the value and appeal of your real estate assets. We will tailor a daily, weekly, or seasonal grounds management program to your needs and budget. We use environmentally-friendly products and business practices to help you ensure a safer, cleaner property. And you can count on our trained, uniformed staff to deliver all the grounds management services you need without disrupting your daily business operations.